How do I buy a Puff City Franchise? 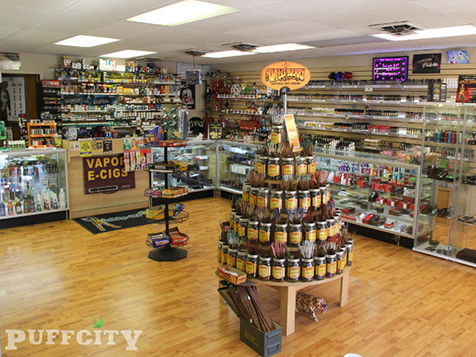 Puff City is a unique one stop smoke shop offering consumers the opportunity to purchase a large selection of cigarettes, cigars, tobacco, electronic cigarettes, e juices, glass, vaporizers, hookahs and accessories. By offering a wide range of products that appeal to various age groups, the business sets itself apart from convenience stores and other retail smoke shops. Everything and anything that a smoker may need can be found at Puff City. Open Puff City in any of these available states: AL, AK, AZ, AR, CA, CO, CT, DE, FL, GA, HI, ID, IL, IN, IA, KS, KY, LA, ME, MD, MA, MI, MN, MS, MO, MT, NE, NV, NH, NJ, NM, NC, ND, OH, OK, OR, PA, RI, SC, SD, TN, TX, UT, VT, VA, WA, WV, WI, WY, DC. Puff City caters to a wide market; those who are new to vaping and those who are experts, those who smoke and those who want to kick a cigarette habit. Today, a new generation of smokers are interested in vape, electronic cigarettes, flavored hookah tobacco and other tobacco and non-tobacco products. 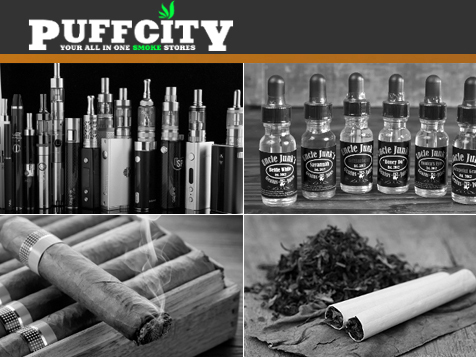 Puff City has created a business model that satisfies all varieties of smokers. This opportunity gives business owners a chance to keep up with new trends, compete in the changing industry, grow a business and serve customers to the highest standards. Puff City partners with premium, American-made e-liquid brands to bring a variety of the best e-juice on the market. The stores offer the largest and most convenient selection of eJuices and do not sell unbranded, homemade e juices like other smoke shops. If you're interested in replicating this successful formula for a growing smoke shop business, complete the inquiry form today. *According to the 2015 Vape Shop Index, released by ECigIntelligence, Roebling Research, E-Cigarette Forum and the Smoke-Free Alternatives Trade Association (SFATA). Puff City is not currently active in our directory, but here are some other recommended selections for you to explore.